, Okay, Now Do You Surrender? The Best American SeriesÂ® is a registered trademark of Houghton Mifflin Harcourt Publishing Company. â¢ is a trademark of Houghton Mifflin Harcourt Publishing Company. No part of this work may be reproduced or transmitted in any form or by any means, electronic or mechanical, including photocopying and recording, or by any information storage or retrieval system without the proper written permission of the copyright owner unless such copying is expressly permitted by federal copyright law. With the exception of nonprofit transcription in Braille, Houghton Mifflin Harcourt is not authorized to grant permission for further uses of copyrighted selections reprinted in this book without the permission of their owners. Permission must be obtained from the individual copyright owners as identified herein. Address requests for permission to make copies of Houghton Mifflin Harcourt material write to [email protected] or to Permissions, Houghton Mifflin Harcourt Publishing Company, 3 Park Avenue, 19th Floor, New York, New York 10016. These stories are works of fiction. Names, characters, places, and incidents are products of the authors' imagination or are used fictitiously. Any resemblance to actual events, locales, or persons, living or dead, is entirely coincidental. Mysterious Press, September 15, 2015. Copyright Â© 2015 by Megan Abbott. Reprinted by permission of Megan Abbott. vol. 11, no. 2. Copyright Â© 2015 by Steve Almond. Reprinted by permission of Steve Almond. issue 65. Copyright Â© 2015 by Matt Bell. Reprinted by permission of Matt Bell. Red Dawn: Best New England Crime Stories. Copyright Â© 2015 by Bruce Robert Coffin. Reprinted by permission of Bruce Robert Coffin. issue 207. Copyright Â© 2015 by Lydia Fitzpatrick. Reprinted by permission of Georges Borchardt, Inc., on behalf of the author. edited by Art Taylor. Copyright Â© 2015 by Tom Franklin. Reprinted by permission of Tom Franklin. by Stephen King. Copyright Â© 2015 by Stephen King. Reprinted with the permission of Scribner, a division of Simon & Schuster, Inc. All rights reserved. Charlie Martz and Other Stories: The Unpublished Stories of Elmore Leonard. Copyright Â© 2015 by Elmore Leonard, Inc. Reprinted by permission of HarperCollins Publishers. May 2015. Copyright Â© 2015 by David Evan Lewis. Reprinted by permission of Evan Lewis. edited by Nancy Kilpatrick and Caro Soles, July 1, 2015. Copyright Â© 2015 by Robert Lopresti. Reprinted by permission of Robert Lopresti. no. 61. Copyright Â© 2015 by Dennis McFadden. Reprinted by permission of the author. July 2015. Copyright Â© 2015 by Michael Noll. Reprinted by permission of Michael Noll. by the editors of Joyride Press, August 2015. Copyright Â© 2015 by Todd Robinson. Reprinted by permission of Todd Robinson. January 2015. Copyright Â© 2015 by Kristine K. Rusch. Reprinted by permission of Kristine K. Rusch. April 7, 2015. Copyright Â© 2015 by Georgia Wilson. Reprinted by permission of Georgia Wilson. edited by Clay Stafford and Jeffery Deaver, October 27, 2015. Copyright Â© 2015 by Jonathan Stone. Reprinted by permission of Jonathan Stone. by Art Taylor, September 15, 2015. Copyright Â© 2015 by Art Taylor. Reprinted by permission of Henery Press, LLC. vol. 58, no. 3, Summer 2015. Copyright Â© 2015 by Susan R. Thornton. Reprinted by permission of Susan R. Thornton. June 2015. Copyright Â© 2015 by Brian Tobin. Reprinted by permission of Brian Tobin. Spring 2015. Copyright Â© 2015 by Saral Waldorf. Reprinted by permission of Saral Waldorf. of the year, a very gratifying milestone. The series began when my agent, Nat Sobel, and I were having lunch, as we have every month for the past thirty years. In the middle of a sentence about who knows what he said, “I have an idea.” This is common in our relationship, as I would argue that he is the best and most creative agent on the planet. of the year, an annual event that began in 1915. He suggested that it was time for a similar mystery series and thought I should be the editor. I agreed. He went back to his office, called the editor in chief of Houghton Mifflin, and they came to an agreement in two minutes. For my first guest editor, I wanted someone who was an accomplished author, not just in the mystery category but one who brought serious literary credentials to the table as well. Being a bestseller was not a requirement but was certainly a desirable element. I aimed high and called my friend Robert B. Parker, who agreed to take on the job without hesitation. To this day, his introduction to the 1997 edition remains the most erudite and comprehensive essay in the history of the series. The book went on to make the bestseller list in Boston and sold enough copies nationally to make Houghton Mifflin happy. Reflecting on the past twenty years reminds me of how much has changed but also how much has remained the same. Changes? The publisher is now Houghton Mifflin Harcourt, following a merger of these two honored houses, both with long histories of excellence. The editor in chief has changed twice during those two decades. The publishing landscape has changed, with more and more mergers, though there is less impact on readers than one might have expected. The bookselling landscape has changed even more. Twenty years ago, Amazon was just beginning to emerge as a major force; today it dominates the bookselling world. Whereas the giant book emporiums of Barnes & Noble and Borders had forced many independent bookshops out of business, the marketplace dominance of Amazon has forced Borders out of existence and seriously threatens Barnes & Noble, while further crippling the independent bookstore. The ray of light is that more independent bookstores have opened in America during the past three years than closed their doors. Similarities? I am still the series editor, and the methodology of determining which stories make the cut remains the same. My invaluable associate Michele Slung reads and evaluates thousands of stories every year, culling those that clearly do not belong on a short listâor a long one either, for that matterâto determine if they have mystery or criminal content, frequently impossible to know merely by reading the title, as well as whether they have any literary merit. I then read the stories that need to be considered in order to arrive at the fifty best (or at least those I like the most). Those are sent to the guest editor, who selects the twenty stories that make it into the book; the remaining thirty receive honorable mention. The best writing makes it into the book. Fame, friendship, original venue, reputation, subjectânone of it matters. It isn't only the qualification of being the best writer that will earn a spot in the table of contents; it also must be the best story. Another similarity from the first book to the twentieth has been the quest to have the right person serve as the guest editor. Willingness to do this is an act of generosity. Every guest editor for this series has been a national bestseller, and therefore these are authors who are asked to do something virtually every day of their lives: write a story, make a speech, sign a book, visit a bookshop or library, provide a quote for a dust jacket, offer advice about how to be a better writer or a more successful one, attend a conference or conventionâthe list goes on. was published in 1988, and there have been eighteen further adventures of Lynley and Havers, as well as four young adult novels and two short story collections. I also am in debt to previous guest editors; my thanks continue to resonate for James Patterson, Laura Lippman, Lisa Scottoline, Robert Crais, Harlan Coben, Lee Child, Jeffery Deaver, George Pelecanos, Carl Hiaasen, Scott Turow, Joyce Carol Oates, Nelson DeMille, Michael Connelly, James Ellroy, Lawrence Block, Donald E. Westlake, Ed McBain, Sue Grafton, and, of course, Robert B. Parker. 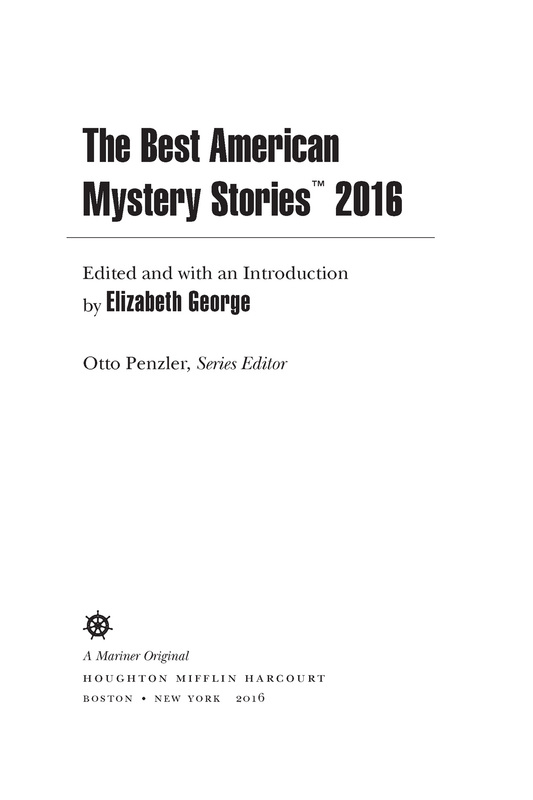 While it is redundant to write it again, since I have already done it in each of the previous nineteen volumes of this series (although it is painful to acknowledge, I do recognize that not everyone reads and memorizes my annual forewords), it is fair warning to state that many people erroneously regard a “mystery” as a detective story. The detective story is important but is only one subgenre of a much bigger literary category, mystery fiction, which I define as any work of fiction in which a crime, or the threat of a crime, is central to the theme or the plot. While I love good puzzles and tales of pure ratiocination, few of these are written today, as the mystery genre has evolved (or devolved, depending on your point of view) into a more character-driven form of literature, with more emphasis on the “why” of a crime's commission than a “who” or “how.” The line between mystery fiction and general fiction has become more and more blurred in recent years, producing fewer memorable detective stories but more significant literature.